We are all looking forward to a great day at next week’s St John Charity Golf Day and all the hard work is bringing together what is promising to be a great day. The support of the Top End community has been fantastic with some 28 teams signed up and many great prizes secured. Looking forward to seeing you all there! National initiative we can recognise this with a Bystander First Aid Award. The story was shared in both the NT News and Centralian Advocate – Please see below. Our new St John Ambulance Centre in Katherine is getting closer to us moving in and we hope to have an official opening and celebration in the coming weeks. Our Paramedic of the year awards are open again and nominations are being called for to recognise our dedicated, caring and professional Paramedics. Please encourage anyone you hear that has experienced our service to provide us with feedback. We can then use your nomination to recognise the great work of our Paramedics, Patient Transport Officers, and Communications Officers (Emergency 000 call takers and dispatchers). Have an enjoyable read and don't miss out on our Mother’s Day special offer. A woman has been rewarded for her attempts to save the life of a man who suffered a heart attack while climbing Mount Gillen. The award was presented by Craig Garraway, the Operations Manager for St John Northern Territory, who told his gathered colleagues and the media about the situation Mr Henry found herself in on March 7. “A doctor was walking up Mount Gillen and we received a 000 call. The man was suffering chest pains at the time,” Mr Garraway said. It was revealed Ms Henry had spoken with the victim, before he took a turn for the worse. She then spent up to 30 minutes trying to revive Mr Al-Khayyat before paramedics arrived and took over. “Our paramedics were so overwhelmed by what you’d done, they actually wrote to me and asked if we could award you in some way,” Mr Garraway said. Ms Henry was able to put into practice the result of extremely up-to-date first aid training, which was a requirement of her job as a personal trainer. She urged others to follow suit. Paramedics Brock Hellyer and Teagan Galvin attended the scene and also praised NTES for their professionalism during the retrieval. Is your first aid up to date? Visit www.stjohnnt.org.au/courses to book online or Call 8959 6652 Alice Springs or 8922 6228 for Darwin. With Mother's Day just around the corner, what a better gift to give that special lady than a gift that could save a life. Get yours today, these are a limited edition and in high demand. St John Ambulance are offering a special pink Personal Leisure first aid kit for just $32.30, that's a saving of 15% off RRP. T's & C's: Not valid in conjunction with any other offer, personal shoppers only. Offer valid until 12 May. Only available at 416 Stuart Highway and 50 Dripstone Road Casuarina. PARAMEDICS. You see them on the roads every day going about their work and never give them a second thought, until you need their help. Paramedics are the unsung heroes who work tirelessly to save lives, help the sick and injured, dealing with any number of confronting and emotional situations. It is the role of the Paramedic not only to treat the injury or illness as they see it, but to also treat the patient and family with compassion and respect. We need your support to nominate and thank these everyday heroes. 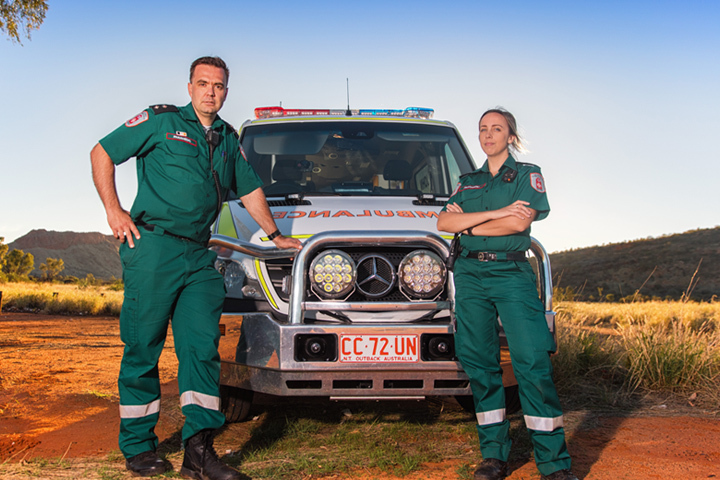 The Rotary Club of Darwin Sunrise and St John Ambulance NT are now seeking nominations from the public for this year’s awards and encourage patients, their family or carers to nominate a paramedic who has demonstrated outstanding abilities for the annual Paramedic of the Year Awards. The awards have been supported by the tireless work of the Rotary Club of Darwin Sunrise for the past 17 years. Without their support we would not be able to recognise the fantastic work of our paramedics, patient transport officers and communications officers. If you know of anyone who deserves to be nominated for this award, please send in a nomination now. Nominations can be kept anonymous if preferred. A copy of the nomination form can be downloaded here www.stjohnnt.org.au/paramedicoftheyear or from the Rotary Club of Darwin Sunrise website www.rotarydarwinsunrise.net.au for further information regarding the awards and to read about last year’s winner Samantha Cooper from Darwin. Completed forms must be returned by COB Friday 14 July. field of 22 nominations, herself receiving two nominations from patients she had treated. Both nominations citing her calm, reassuring and professional manner, as well has her ability to clearly communicate the situation to them as some of the qualities that earned their respect and well deserved nomination. If you believe you know someone deserving of such recognition, please submit a nomination form today. Earlier this month, St John Alice Springs participated in a Major Crash Recovery Demonstration, which involved the combined services of both NT Fire and Rescue Service and NT Police, as part of the larger Crime and Safety Expo, which was attended by approx. 1000 people over the course of the morning. An old car with a mannequin was used to simulate a motor vehicle accident involving a car vs tree, with one patient who was unrestrained during the accident, causing them to be ejected through the windscreen of the vehicle. NT Fire and Rescue crews worked in conjunction with paramedics to stabilise and free the patient for transport. During the demonstration both NT Fire and Rescue, St John Ambulance and NT Police representatives spoke to the crowd regarding a range of subjects specific to their area of operational involvement. Congratulations to Laura, winner of the e-newsletter signup competition for March. Laura has won a Pink Personal Leisure kit valued at $38.00 RRP.